SAM is changing the way you do business by merging nine legacy, siloed systems into one. This provides users one login and access to all the capabilities previously found in the legacy systems. SAM also consolidates data from these systems into a single database, eliminating data overlap while sharing the data across the award life-cycle. You are filing a new SAM registration (formerly CCR registration and/or ORCA certification). You are renewing an existing SAM registration (formerly CCR registration and/or ORCA certification). You are a vendor in the private sector wanting to do business with any federal government entity/agency. You need an active SAM (CCR) Registration in order to apply for grants at Grants.gov. You desire to acquire a DUNS number, CAGE code and/or MPIN for SAM Registration. You receive federal assistance and are a local or state government entity/agency or school/university. You wish to be eligible for FEMA contracts by becoming registered and certified. You are mandated to be registered and certified by your Authorized Contracting Officer (ACO) because you are a sub-contractor under a prime contractor. You wish to modify and optimize your Small Business Administration (SBA) profile. Attention: Due to the migration of the CCR & ORCA legacy systems to the System for Award Management (SAM), new entity registrations and renewals in SAM may take several weeks for approval. We offer registration & migration services for the SAM system so you can stay focused on running your business. If you choose to handle the registration or migration of your current registration yourself there is a 350-page instruction manual located at this link within our site. The System for Award Management (SAM) is the Official U.S. Government system that consolidated the capabilities of CCR/FedReg, ORCA, and EPLS. There is NO fee to register with SAM directly and you can go to our help page and download the”How To” guide and complete the system yourself. You may elect to hire us as third party consultant to facilitate your registration or migration of your existing account for a one time fee of $495. Our company specializes in business compliance systems to secure credit, contracts and the registration process. When you meet the compliance factors to obtain government contracts you are eligible to apply for our credit builder program and qualify for $50,000 in business credit without any personal guarantee. Our business credit builder program is designed to supply that credit within 6-months of your enrollment to help you fund your government contract, ask us for details. Small businesses interested in pursuing federal contracts have many options available to represent their company to potential buyers, to research the federal marketplace for available opportunities, and understand the competition. 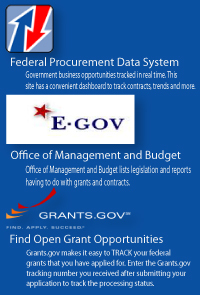 To prepare your business for federal contracting opportunities, it is important for you to understand these resources. If you are ready to bid on federal contracts, it’s necessary to submit your business profile to the primary database that federal agencies use to locate contractors. To send your business “resume” to the government, register a business profile with the System for Award Management, also known as SAM. Agencies can search for your business based on several factors, including capabilities, size, location, experience and ownership. Once you have registered you will need to access financing and contracting resources for your small business to pursue federal contracts. We have those resources available to you as well so that you can focus on running your business not paperwork.